Sometimes the simplest ideas are the most surprising. 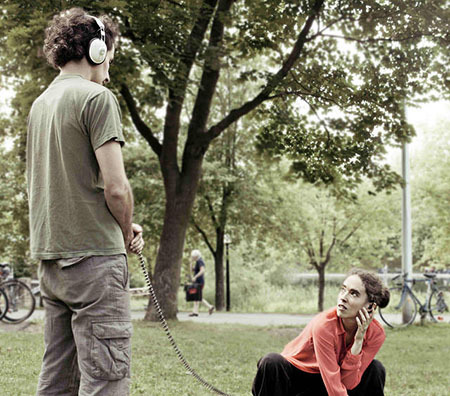 Écoute pour voir at SummerWorks is so straightforward you might just miss it: dancers pair off one-on-one with audience members, sharing a single iPod with two sets of headphones. Don’t shrug off the modesty of this concept—the performance is as beautiful as it is candid, and utterly satisfying. A free outdoor show performed mainly by non-professional dancers, Écoute pour voir may not stand out in the SummerWorks line-up as much as some of the more ambitious works by well-known artists, but once you find it, it’s irresistible. I was hunting around for the performers at Trinity Bellwoods Park when I spotted their bright pink shirts, moving en masse to an open field by the community centre. The show migrates around the city: today it’s Theatre Passe Muraille, and Sunday it’s at the Theatre Centre. Just look for a floral bunch with big white headphones protruding from their clothes. This particular incarnation of Écoute pour voir is the product of a collaboration between Danse Carpe Diem/Emmanuel Jouthe from Montreal and Toronto’s Workman Arts, a multi-disciplinary organization for artists who’ve experienced mental illness. The show is part of SummerWorks‘s National Series and appears in different forms all over Canada. The dancers in Écoute pour voir choose their own songs and work with choreographers to create their movements. Whenever I see dance, I always search for the subtle ways that the personalities of the individual dancers emerge through the choreography. In this show there is almost nothing but the unique person in front of you: the perfectly specific intersection of attitude, sensibility, approach, and physicality. It’s incredibly intimate, of course, and made me think that eye contact is a component of dance that needs more exploration. This is the kind of closeness that usually requires time to create, but here we’re able to leap over all that work because it’s a performance. Performers temporarily shake off the strictures of this plodding world, and Écoute pour voir lets audiences join them out there, beyond our usual limits and hesitancies. Kimberly Nichols, who danced to Michael Jackson’s Love Never Felt So Good, certainly understood the potential of the performance to create a safe space for a strong encounter. Bold and provocative, she took the opportunity to be joyful, direct, and playfully flirtatious. Admittedly, sometimes the intimacy gets a little intense. Etasha Joshua made me cry a little and then stopped her performance mid-way because it was getting heavy. The sudden halt was jarring, but I’ve never known a performer to take such unapologetic control over the moment. Something about lurching to a stop reinforced how vivid the performance was. It worked. Écoute pour voir celebrates immediacy over expertise. There are many shows at SummerWorks that call on audiences to participate with the performers, and it’s all interesting. But this show creates an encounter that is at least as engaging and personal as any of those, while still letting the viewer relax into the moment. The dancers are in charge—they’re doing their thing. Écoute pour voir plays at SummerWorks in three locations: Trinity Bellwoods Park (155 Crawford Street), Theatre Passe Muraille (16 Ryerson Ave), and the Theatre Centre (1115 Queen Street West).